Its the underlying assumption that I find most despicable. Do you own your body? Or does the government? After all, the UK government “gives” you absolutely 100% free health care. (Just don’t look too closely at what you actually get). So if the government is responsible for your health care, does that mean it should be able to control your actions and bodily functions? While this might be considered some sort of hypothetical trial balloon to demonstrate absurdity – do you really think that there aren’t some government planners who are actually planning for this action? Of course, no one would actually try and implement mass sterilization, would they? But remember that doctors organizations and government bureaucrats now consider it safe to say that some people should not be treated because of the choices they have made in their life. 20 years ago, would the average citizen believe that this would be considered mainstream thought? Its funny that all the liberal hysteria about loss of freedoms completely misses the fact that the biggest loss will be coming as the “gift” of government. 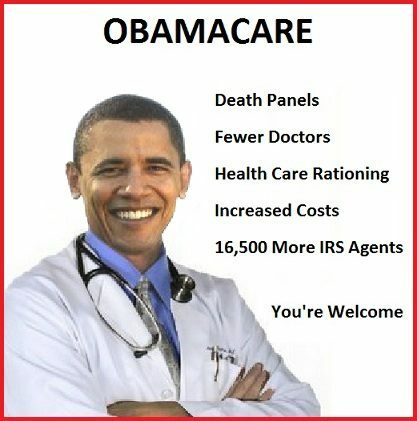 Remember that this free Obambi-care or Hillarycare will change the basic standing between government and citizens. Once you give responsibility for your health care to government, government will own you and your actions.